Special Price - 20% off! Irish crystal toasting flutes feature the Claddagh that is enhanced with shamrocks. These Irish champagne flutes are sold as a pair. 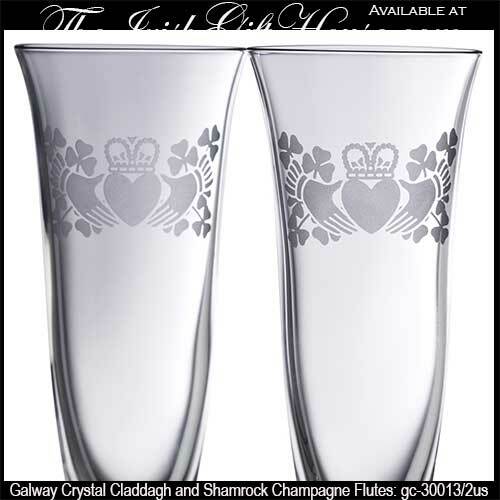 This pair of Claddagh champagne flutes are proudly etched with the famous Irish icon that is enhanced with shamrocks. 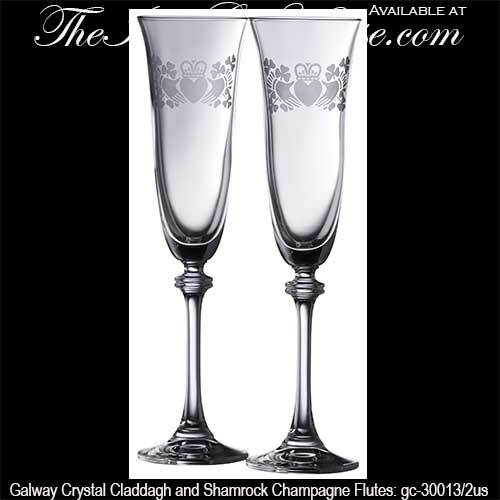 The Claddagh champagne glasses are perfect as toasting flutes for any celebration including Irish weddings. The pair of Galway Crystal glasses measure 10 1/4" tall x 2 1/2" wide at the rim. The Irish wedding flutes are gift boxed with Claddagh and shamrock history cards that are complements of The Irish Gift House. Pewter ice bucket features an embossed Claddagh motif. The Claddagh ice pail is ideal for champagne and wine bottles. This Irish champagne flute holder features the Claddagh. Irish crystal wedding flutes feature the Celtic Trinity knot along with delicate shamrocks.